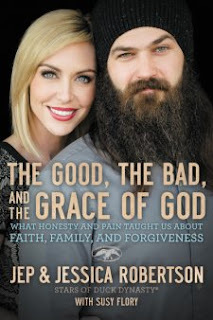 "The Good, the Bad, and the Grace of God -- What Honesty and Pain Taught Us about Faith, Family and Forgiveness" by Jep and Jessica Robertson (of Duck Dynasty) with Susy Flory... Reading this book is like being invited to Jep and Jess' for a backyard bonfire and some great conversation. (How fun would that be!). There is something that everyone can find to relate to in this book -- whether it's feeling insecure, keeping secrets, questions about God and Faith, addictions or divorce. And because Jep and Jess are so honest in telling their stories you begin to feel a kinship with them. you can come out of it. You can be washed clean." This book gives insight into the personal triumphs and struggles of Jep and Jessica throughout their lives. Funny stories about sibling relationships or hunting trips are interspersed with stories about the strong bonds of family and painful stories of love and betrayal. So many people struggle with the idea that they are beyond God's love. Jep and Jessica talk about their insecurities and their realization that God loves us as we are -- even with all our secrets and sins. Jep says in the book: "As I looked at God's Word with fresh eyes, I realized that repenting and turning to God meant I was saved and forgiven. Jesus' blood covered my sins and redeemed me from the path of destruction I was on. I couldn't have ever been good enough on my own." No one is good enough on their own merit which is why we need a Saviour. Jep and Jess highlight how important it is to have your own faith and to recognize it isn't our works that save us -- it is Jesus' death and resurrection that provides redemption for us. Be sure to check out this book. And if you have any questions about Jesus' death and resurrection -- please don't hesitate to e-mail me or leave a comment below.